Luxury art tile, hand built porcelain vessels, and porcelain jewelry by artist Bronwyn Simons. The handmade relief tiles in our Vancouver Island Collection are inspired by the natural beauty of the Northwest Coast that surrounds us every day at Terra Home. Each design in this collection is an original Terra Home creation. 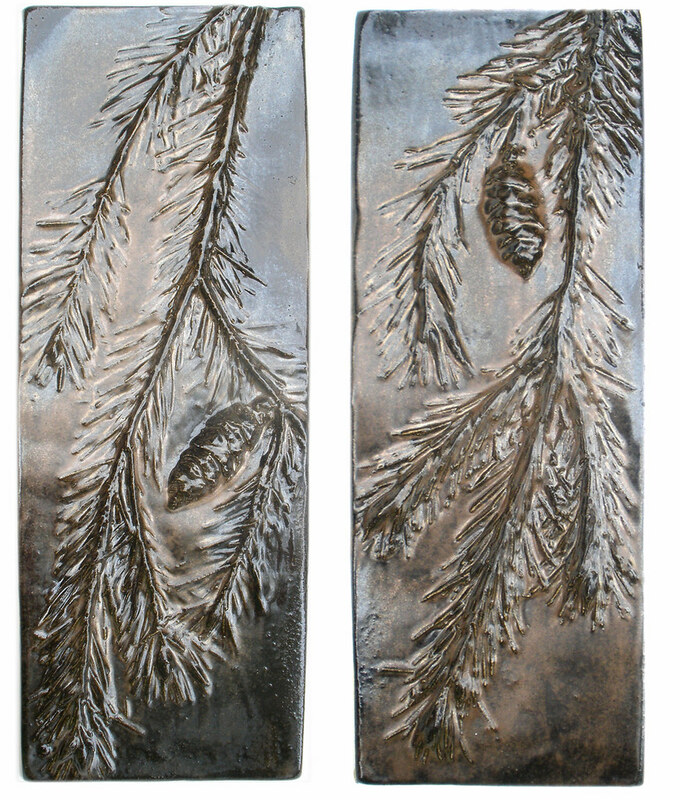 The relief images are cast from actual natural objects gathered from forests and beaches; real pine cones, pine boughs, and seashells. These tiles are for architectural and interior embellishments like back splashes, entryways, and fireplaces like this one. I am currently accepting select art tile commissions, contact me if you'd like me to consider your project. As well, single pine cone and pine bough pieces are occasionally available in the Shop. "I get wonderful compliments every time someone comes into the kitchen. In addition, the tile installer stated it was the very BEST quality of tile she ever worked with!! Thank you so much for your talent and vision!!" R.M., New Jersey. "Your tiles are the highlight of our kitchen!" B.C., Florida. View this job here. "The tiles are SO worth the wait! They are absolutely exquisite; there is no way that their beauty and uniqueness could possibly be captured on a computer monitor. They are so gorgeous." E.H., Connecticut. "Thanks again so much for the gorgeous tiles. I'm especially enjoying the many ways the Koi and Willow tiles can work together. I've really appreciated working with you both..." J.H., Colorado. "Thank you so much for everything! We were delighted with the ease and enjoyment of the custom design process..."
M.G., Ontario. View this job here. "The clients already had a stone back splash installed in their butler's pantry when I was brought in on the job, and were really unhappy with how monolithic it looked. I suggested an insert of your tile, and now they LOVE how it looks..." R.H., California. View this job here. "I received the box of tiles yesterday... The colors of your glazes are so beautiful! You do good work with your art. Thank you so much. You inspire me to work in clay!" J.A., Colorado.